It's official: Moon Boots are moonwalking back onto the runway! Part of what I love about writing for Bustle is that I am able to broadcast trend forecasts. Something I've found ironic in fashion is how often trends branded as "ugly" return. For example, Louis Vuitton combat boots were all the rage at NYFW, and so-called "ugly" sandals have been ruling the street style game for several summers now. So, in that same vein, it is with great pleasure and irony that I am here to announce the return of Moon Boots to winter 2015 shoe trends. I woke up this morning and opened Man Repeller (Leandra Medine, I love you) as I am apt to do, and much to my chagrin there it was. I decided that maybe this was all just one crazy fluke and started scouring the web in disbelief. However, several publications and style casters were saying the same thing: Moon Boots are back, baby. In order to understand Moon Boots, you need to know their history. Moon Boots were launched in the early '70s by the Italian manufacturer Tecnica Group. The designer Giancarlo Zanatta was inspired by watching the Apollo 11 lunar landing. In the early 2000's — my spirit years — Moon Boots were a designer drug for fashion forward celebrities along with Paul Frank t-shirts. These are the same shoes that Paris Hilton would not stop wearing in 2007 (yes, the Britney breakdown year). They have popped up sporadically over the past few years, but never returned to their former glory days in full. However, last winter Olivia Palermo rocked a pair of yellow Moon Boots in the Swiss Alps with her husband, and made some real waves. The year 2010 marked the 40th anniversary of Moon Boots, and to celebrate the company decided to rebrand. They turned toward a more futuristic approach with slimmer fits as well as the addition of left and right foot fittings. Now the brand recognizes that the boots are geared less toward skiers and more toward people living in cold climates doing day-to-day activities. With this in mind, Moon Boots partnered with the likes of Jimmy Choo, LV, Moschino, Dior, and other well known high-end designers. They hoped to cater to many different types of clientele. This is also how they partnered with Disney and the Star Wars franchise in time for the new movie. If you, like me, are a sane person and love Star Wars you can buy R2D2, C3PO, Stormtrooper, Droid, and "Star Wars Fire" themed Moon Boots in time to see the film in theaters. My personal Moon Boot experience was short lived. I saw them in Nordstrom with my Mom and pointed them out to her. Let's just say, my Mom has more of a classic style which she likes to describe as "Parisian." 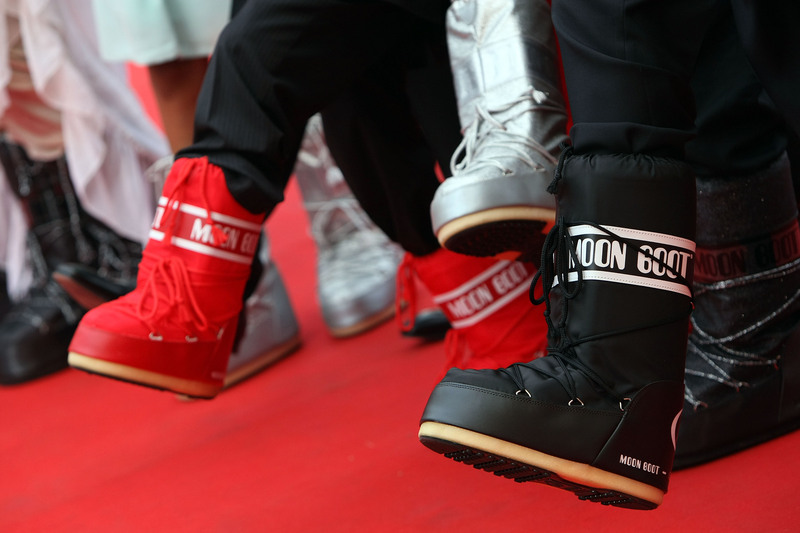 Would you ever catch a Parisian wearing Moon Boots? Probably not. However, now that I am making my own money and living in a much colder climate than drought-ridden California, I may just have to take a second look this season.